The days of staying with the same company your entire life are over. In the past, companies have had more stability in the economy to invest more in workforce development particularly tailored to train their employees. Companies would hire young adults just out of high school and train them in entry-level positions. Now, employers rely largely on potential employees to train themselves, which is a big part of the reason why so many entry-level jobs today require a minimum of a bachelor’s degree. Try paying back student loans on an entry-level salary. It’s not fun, and it’s not necessary. Instead of spending $30 thousand a year on your bachelor’s degree, you can turn your internship into a college degree in three simple steps. You can do this while you’re still in high school or just out of high school. You can do this at any point in your life. Many internships are unpaid or simply provide a stipend, but you can work a part-time job on the side to fund this first step if need be. The investment in time will be well worth the time and money you save in the long run. Most companies that require a bachelor’s degree or higher for entry-level positions hold no such requirements for interns. Target companies and organizations in a field you are deeply interested in, and in which there is the potential for an internship to grow into a paid job position, or an internship position with more and more responsibilities and management opportunities. Upward mobility within the company is what you are looking for, even if it takes a while. Stick with your internship and see it through to the next level, whether it be an internship position or actual job with the same company, or an internship or job in a different company but in the same field. The key here is to progressively learn new skills and take on more responsibility within your field. At the same time, take classes at the local university or community college on the side, seek out training that will expand your skill set, and take on hands-on projects in your field that you enjoy. The key is to expand your knowledge base and skill set, and show that you have and continue to grow in your field of employ. Cultivate good relationships with your employers and take advantage of any training opportunities your internship or job may offer. Don’t worry so much about your paycheck. Remember, you’re earning a $120 thousand dollar bachelor’s degree for free. By this point, all of your work is already done. You’ve already spent years working in your field of expertise, expanding your knowledge base and skill set, and taking on more responsibilities within your field. You’ve already taken classes to learn critical skills and specialized knowledge, and you’ve already attended specialized trainings tailored to the work you do. Without taking out a single student loan or enrolling in college, you have successfully learned more than a college degree could ever teach you alone. Now all you have to do is give us a call. 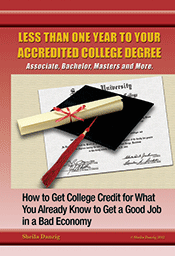 We can convert your years of work experience, training, and class credits into a legitimate US Bachelor’s Degree. You will now have a comprehensive college degree. If you’re like hundreds of thousands of other people across the country who opted to work instead of jumping right into college, or have taken a few classes here and there but never completed a degree, you’re already at step three. Give us a call for a free consultation. We can help you turn your experience and expertise into the Bachelor’s Degree you have already earned.